Fresh off the tails of Made In Strathcona’s Most Walkable Street initiative, we’re gearing up for our 2018 Walk Strathcona campaign: 10 Blocks of Passion. 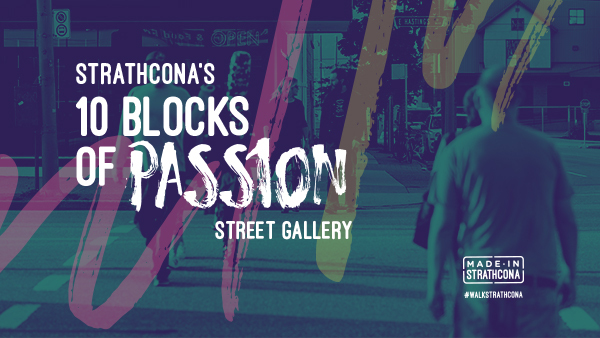 10 Blocks of Passion will highlight 10 unique art pieces inspired by intimate personal stories from Strathcona. Showing a human look at tales from behind the scenes of our diverse array of businesses. As one of the city’s oldest neighbourhoods, nestled just east of downtown, Strathcona is home to over 450 businesses, 7,000 employees and 11,000 residents – home to thousands of unique stories and voices. The area also boasts one of the highest concentrations of artists in Canada. Its rich history and unique offerings have attracted a number of different businesses and people. To celebrate our unique business community, the business district will be transformed into a walkable street gallery. Featuring original artworks inspired by the personal stories of Strathcona business members who have contributed to the culture of our neighbourhood. We hope to inspire more people from across the Lower Mainland to #WalkStrathcona and learn more about what makes us one of Vancouver’s most inspiring neighbourhoods. We will be selecting 24 business members to highlight, all of which will be featured on our social media channels. Of the 24 selected, 10 stories will be paired with an artist commissioned to create an original work inspired by these stories to be displayed in Strathcona. We’ll be looking to highlight businesses from all areas of the SBIA and across all sectors. Are you an SBIA business member with an intimate personal story to highlight? Are you an artist who would like to be featured in 10 Blocks of Passion? All applications are due by December 1, 2017 – final selections will be announced December 15th, 2017.